به منظور بررسی اثرات ورمی­کمپوست و نیتروکسین بر صفات بنه و عملکرد گل زعفران، آزمایشی در سال 95-1394 به صورت فاکتوریل بر پایه طرح پایه بلوک‏های کامل تصادفی، با سه تکرار در مزرعه دانشکده کشاورزی دانشگاه بیرجند اجرا شد. تیمارهای آزمایش، شامل ورمی­کمپوست در چهار سطح (صفر، 5، 10 و 15 تن در هکتار) و نیتروکسین در سه سطح (0، 5 و 10 لیتر در هکتار) به­صورت مصرف خاکی بودند. نتایج نشان داد، ورمی­کمپوست اثر معنی‏داری بر صفات بنه (وزن کل بنه، متوسط وزن ‏تر و خشک بنه دختری و قطر بنه دختری) داشت، به­طوری­که بیشترین وزن کل بنه در تیمار 15 تن در هکتار ورمی­کمپوست به­دست آمد. همچنین، نتایج سال دوم آزمایش، نشان­دهنده تأثیر معنی‏دار ورمی­کمپوست بر صفات گل (تعداد و عملکرد گل ، عملکرد تر و خشک کلاله) بود، به­طوری­که بیشترین عملکرد کلاله تر و خشک (63/1 و41/0 گرم در متر مربع به ترتیب) در سطح 10 تن در هکتار ورمی­کمپوست حاصل شد، و کمترین مقدار این صفات در تیمار شاهد (77/0 و21/0 گرم در متر مربع) مشاهده گردید. نیتروکسین نیز بر تعداد، عملکرد کل گل تر و عملکرد کلاله خشک تأثیرگذار بود. به­طوری­که، بیشترین میزان عملکرد کلاله خشک ( 36/0 گرم در متر مربع) در تیمار 10­ لیتر نیتروکسین در هکتار و کمترین مقدار این صفت در تیمار شاهد (24/0 گرم در متر مربع) حاصل گردید. اثرات متقابل نشان داد که، سطوح مختلف ورمی­کمپوست و نیتروکسین تأثیر معنی‏داری بر متوسط وزن کل بنه، عملکرد گل، عملکرد تر و خشک کلاله داشت. به­طورکلی، نتایج بیانگر تأثیر مثبت ورمی­کمپوست و نیتروکسین بر صفات بنه و عملکرد گل زعفران بود، به­طوری­که کاربرد 5 لیتر در هکتار نیتروکسین به همراه 10 تن در هکتار ورمی­کمپوست را می­توان برای این آزمایش توصیه نمود. 1Assistant Professor, Department of Horticultural Science and Special Plants Regional Research Center, College of Agriculture, University of Birjand, Iran. The effects of applications of vermicompost and nitroxin on corm characteristics and flower yield of saffron were evaluated under field conditions in the research farm of Birjand University, Iran, during the cropping year 2015-2016. Treatments were of four levels of vermicompost (0, 5, 10 and 15 t.ha-1) and three levels of nitroxin (0, 5 and 10 L.ha-1). This experiment was carried out as factorial based on randomized completely block design with three replications. The results showed that vermicompost improved the corm vegetative indices (total weight of corm, average fresh and dry weight of cormel and diameter of cormel). The highest total weight of corm was obtained in plants treated with 15 t.ha-1 vermicompost. Also results showed that vermicompost improved the saffron flower characteristics (flower number and fresh total yield, flower length, stigma fresh and dry yield) in second year of study. The highest stigma fresh (1.63 g.m-2) and dry (0.41 g.m-2) yield were obtained in plants treated with 10 t.ha-1 vermicompost, while the lowest values (0.77 and 0.21 g.m-2) were recorded in the control. Application of different levels of nitroxin has a positive effect on flower number and fresh total yield, stigma dry yield in the second year of the experiment. The highest stigma dry yield was observed in 10 L.ha-1 nitroxin (0.36 g.m-2), while the lowest value was recorded in control (0.24 g.m-2). Application of different levels of vermicompost and nitroxin had a positive effect on the total weight of corm, average flower length and stigma fresh yield. Thus, the results showed that 5 L.ha-1 nitroxin and 10 t.ha-1 vermicompost had a significant impact on replacement corm characteristics and flower yield of saffron. Alavi Shari, J., Mohajeri, H., and Falaki, M.A. 1994. Effect of plant density on saffron yield. In: Proceedings of the Second Conference of Saffron and Medicinal Plants Cultivation, Gonabad, Iran, 8-9 Nov 1994, p.13-20. Abou-Hussein, S.D., El-Shoragy, T., and Abou-hadid, A.F. 2003. Effect of cattle and chicken manure with or without mineral fertilizers on tuber quality and yield of potato crop. Acta Horticulture 608: 95-100. Alipur Miyandehi, Z., Mahmoudi, S., Behdani. A., and Sayyari, M.H. 2013. The study of animal manures, bio-chemical and corm size on yield and yield components of saffron (Crocus sativus L.) Saffron Research Journal 2: 73-84. (In Persian with English Summary). Amini, S., Maleki Farahani, S., and Shrgi, Y. 2014. Effect of organic fertilizers and biological (PGPR) on the quality of saffron (Crocus sativus L.) National Conference on Medicinal Plants, Islamic Azad University, Science and Research Branch Ayatollah Amoli, 11–14 March 2014, p. 91–96. Amiri, M.E. 2008. Impact of animal manures and chemical fertilizers on yield components of saffron (Crocus sativus L.). American-Eurasian Journal of Agricultural and Environmental Sciences 4 (3): 274-279. Arancon, N.Q., Edvards, C.A., Bierman, P., Metzeger, J.D, Lee, S., and Welc H.C. 2002. Effects of vermicomposts on growth and marketable fruits of field-grown tomatoes, pappers and strawberries. Pedobiologia 47 (5-6): 731-735. Asadi Rahmani, H., and Samavat, S. 1999. Organic matter, its importance and its increase in soil. Technical Journal No. 425, Soil and Water Research Institute. Publishing of Karaj Agriculture Education. (In Persian with English Summary). Aytekin, A., and Acikgoz, A.O. 2008. Hormone and microorganism treatments in the cultivation of saffron (Crocus sativus L.) Molecular Plant 13 (5): 1135-1146. Atiyeh, R.M., Arancon, N.Q., Edwards, C.A., and Metzger, J.D. 2000. Influence of earthworm-processed pig manure on the growth and yield of green house tomatoes. Bioresource Technology 75 (3): 175-180. Bachman, G., and Metzger. 1998. The use of vermicomposting as a media amendment growth of tomatoes. Plant Nutrition 27 (1): 1107-1123. Behdani, M.A., Koocheki, A.R., Nassiri, M., and Rezvani Moghadam, P. 2005. Evaluation of quantitative relationships between saffron yield and nutrition (on farm trial). 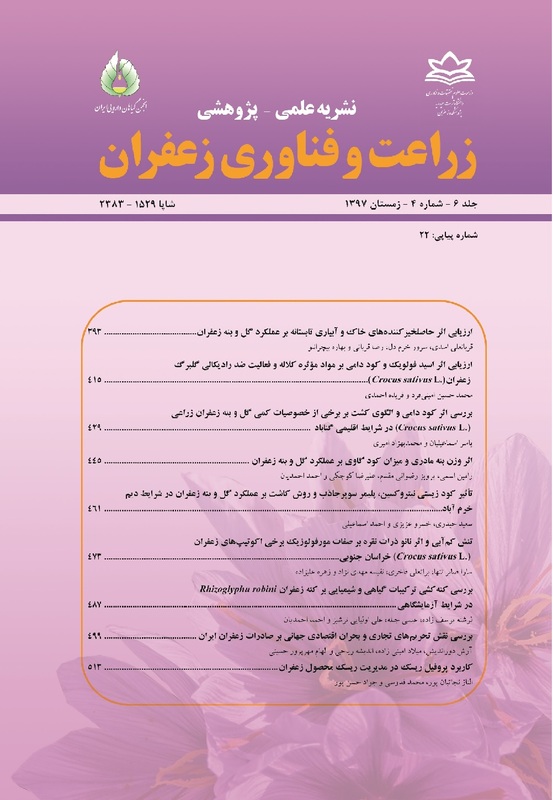 Iranian Journal of Field Crop Research 3 (1): 1-14. (In Persian with English Summary). Behdani, M.A. 2005. Ecological zoning and monitoring of yield fluctuations of saffron in Khorasan. Ph.D. in Agriculture (ecology of crops). Faculty of Agriculture, Ferdowsi University of Mashhad. (In Persian with English Summary). Eldin, M.S., Elkholy, S., Fernandez, J.A., Junge, H., Cheetham, R., Guardiola, J., and Weathers, P. 2008. Bacillus subtilis FZB24 affects flower quantity and quality of saffron (Crocus sativus L.). Planta Medica 13 (74): 16–20. Farokh Shahe, S. 2011. Effect of different levels of nitrogen and vermicompost organic fertilizer on onion yield. First National Conference on Environmental Conservation and Planning. 12–14 May 2011, p. 20–24. Golzari, M. 2016. Effect of bio-fertilizer and mother corm weight on growth, flower and stigma yield and qualitative criteria of saffron. M.Sc dissertation, Faculty of Agriculture Birjand, University of Birjand, Iran. (In Persian with English Summary). Gutierrez-Manero, F.J., Ramos-Solano, B., Probanza, A., Mehouachi, J., Tadeo, F.R., and Talon, M. 2001. The plant-growth promoting rhizobacteria Bacillus pumilus and Bacillus licheniformis produce high amounts of physiologically active gibberellins. Physiologia Plantarum 111 (2): 206–211. Hardtke, C. 2003. Gibberllin signaling: grass growing roots. Current Biology 13 (9): 366-367. Haynes, R.J. 1996. Labile organic matter fraction as central components of the quality of agricultural soils. Advances in Agronomy 85 (1): 221- 261. Shirani, H., Abolhasani Zeraatkar, M., Lakzian, A., and Akhgar, A. 2011. Decomposition rate of municipal wastes compost, vermicompost, manure and pistaco compost in different soil texture and salinity in laboratory condition. Journal Water Soil 25 (1): 84–93. Jahan, M., and Jahani, M. 2007. The effects of chemical and organic fertilizers on saffron flowering. Acta Horticulture 739 (2): 81-86. Jia, Y., Gray, V.M., and Straker, C.J. 2004. The influence of rhizobium and Arbuscular mycorrhizal fungi on nitrogen and phosphorus accumulation by Vicia faba. Annals of Botany 94 (2): 251-258. Kakhki Daneshvar, M., and Farahmand Gelyan, K. 2012. Review of interactions between ecommerce, brand and packaging on value added of saffron: A structural equation modeling approach. African Journal of Business Management 6 (26): 7924-7930. Kolahkaj, Z. 2014. Effect of bacterria stimulus growth on the growth properties of saffron (Crocus sativus L.) in the perennial fields. M.Sc, Faculty of agriculture, University of Birjand, Iran. (In Persian with English Summary). Koocheki, A., Jahani, M., Tabrizi, L., and Mohammadabadi, A.A. 2011. Investigation on the effect of biofertilizer, chemical fertilizer and plant density on yield and corm criteria of saffron (Crocus sativus L). Soil and Water 25 (1): 196-206. (In Persian with English Summary). Liuc, J., and Pank, B. 2005. Effect of vermicompost and fertility levels on growth and oil yield of Roman chamomile. Sciatica Pharmaceutical 46: 63-69. Lucas Garcia, J., Agustin, P., Beatriz, R., Maria, P., and Francisco, J. 2004. Effect of inoculation of Bacillus licheniformis on tomato and pepper. Agronomie 24 (4): 169-176. Martin, E.C., Slack, D.C., Tannksley, K.A., and Basso, B. 2006. Fresh and composted dairy manure applications on alfalfa yield and the environment in Arizona. Agronomy Journal 98 (1): 80-84. Martin, J.P., Black, J.H., and Hawthorne, R.M. 1997. Influence of earthworm-processed pig manure on the growth and yield of greenhouse tomatoes. Bioresource Technology 75 (3): 175-180. Mohamadzadeh, A.R., and Pasban, M. 2007. Effect of sources and levels of organic fertilizers on crop yield of saffron flowers. Tenth Congress of Soil Science, College of Agriculture and Natural Resources, Tehran University, 6-4 September 2007, p. 151–156. Mrkovacki, N., and Milic, V. 2001. Use of Azotobacter chroococcum as potential useful in agricultural application. Annals of Microbiology 51 (2): 145-158. Myers, B.J., Theiveyanathan, S., Obrien, N.D., and Bond, W.J. 1996. Growth and water use of Eucalyptus grandis and Pinus radiata plantations irrigated with effluent. Tree Physiology 16 (1-2): 211-219. Nehvi, F.A., Khan, M.A., and Lone, A.A. 2010. Impact of microbial inoculation on growth and yield of saffron in Kashmir. Acta Horticulture 850 (31): 171-174. Omidi, H., Naghdibadi, H.A., Golzad, A., Torabi, H., and. Fotoukian, M.H. 2009. The effect of chemical and bio-fertilizer source of nitrogen on qualitative and quantitative yield of saffron (Crocus sativus L.). Journal Medicinal Plant 8: 98–109. (In Persian with English Summary). Pandey, R. 2005. Management of meloidogyne incognita in Artemisia pallens with bio organics. Phytoparasitica 33 (3): 304-308. Pierre Anoshi, E., Imam, E., and Jamali, R. 2010. Comparison of the effects of bio-fertilizers with chemical fertilizers on growth, yield and oil content of sunflower (Helianthus annuss L.) at different levels of drought stress. Journal of Agriculture Ecology 2 (3): 492-501. (In Persian with English Summary). Rezaian, S., and Paseban, M. 2007. The effect of micronutrients and manure fertilizers on the quantity and quality of Khorasan saffron. Second International Symposium on Saffron Biology and Technology, Iran, 8-9 April 2007, p.113-117. Rezvani Moghaddam, B., Bkhshayy, S., Ghafouri, A., and Khrmdl, S. 2009. Quantitative characterization of biological fertilizers and vermicomposting on Savory herb, medicinal plants of Iran Industry Development Conference, Tehran, Iran, 8-9 March 2009, p. 223-225. Sabti, M., Movahedi Naeini, S.A.R., Ghorbani Nasr Abadi, R., Roshani, Gh.A., Shahreyari, Gh., and Movahedi, M. 2009. Determination of the appropriate potassium extract in a clay soils with dominant clay and the effect of azotobacter and vermicompost on the concentration and amount of absorbed potassium and yield of wheat. Plant Production Research (Agricultural Sciences and Natural Resources) 16 (4): 59-76. (In Persian with English Summary). Salehi, A., Ghalavand, A., Sefidkon, F., and Asgharzadih, A. 2011. Effect of zeolite, Bacterial inoculum of vermicomposting concentration NPK elements essential oil content and essential oil yield in organic farming chamomile (Matricaria chamomilla L.). Journal of Medicinal and Aromatic Plants of Iran research 27 (2): 188-201. (In Persian with English Summary). Sepaskhah, A.R., and Kamgar-Haghighi, A.A. 2009. Saffron irrigation regime. International Journal of Plant Production 3 (1): 1-16. Sharma, S, Pradhan, K, Satya, S., and Vasudevan, P. 2005. Potentiality of earthworms for waste management and in other uses: a review. The Journal of American Science 1 (1): 4–16. Sundara, B., Natarajan, V., and Hari, K. 2002.Influence of phosphorus solubilizing bacteria on the changes in soil available phosphorus and sugarcane and sugar yields. Field Crops Research77 (1): 43-49. Teimori, S., Behdani, M.A., Ghaderi, M.G., and Sadeghi, B. 2013. Investigation on the effect of organic and chemical fertilizers on morphological and agronomic of saffron (Crocus sativus L.) corm criteria. Journal of Saffron Research 1 (1): 36–47. (In Persian with English Summary). Temperini, O., Rea, R., Temperini, A., Colla, G., and Rouphael, Y. 2009. Evaluation of saffron (Crocus sativus L.) production in Italy: Effects of the age of saffron fields and plant density. Food Agriculture and Environment 7 (1): 19-23. Wu, S.C., Cao, Z.H., Li, Z.G., Cheung, K.C., and Wong, M.H. 2004. Effect of bio fertilizer containing N-fixer, P and K solubilizers and AM fungi on maize growth. Geoderma 125 (1-2): 155-166. Zaller, J.G. 2007. Vermicompost as a substitute for peat in potting media: Effects on germination, biomass allocation, yields and fruit quality of three tomato varieties. Scientia Horticulturae 112 (2): 191-199.